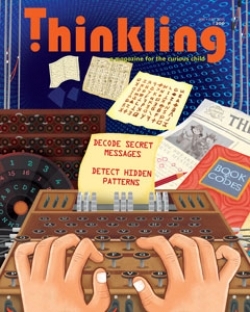 We’re on a quest to crack some of the most fascinating forms of patterns and codes in our Summer Issue- Codebreakers. Learn about the history of cryptography (or code-making) in Hourglass and check out some clever tricks of an ancient trade. Flip to Green Room to read about how languages are related to one another through patterns. Break the code and you open up a whole new world by understanding another civilization! Find something that you want to try out or make your own? Set up a secret club with your friends, complete with a secret language. And speaking of secrets, we’ve kept and spilled a few. Read more about it in Sticky Situations. As you read through this issue, don’t forget to lift your head up for all the patterns around you! Building steps, pavement stones, leaf arrangements, spots on insect wings, maybe even cars at a traffic light. The world is written in patterns and codes, you just have to take the time to look.